"The premise of Columbia University’s free Lunchtime Concerts, presented at Philosophy Hall, an intimate reading room ideal for chamber music, is that only one work should be played per program. On Monday, for the first installment of the pianist Benjamin Hochman’s survey of Bach’s six solo keyboard partitas, that work was quite short: the Partita No. 1 in B flat, which lasted just 16 minutes in an elegant, flowing performance. 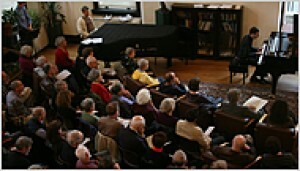 Even preceded by Mr. Hochman’s insightful spoken analysis of the piece, with excerpts, the program took only 30 minutes. Some people had waited twice that long to claim a seat. Including standees, Philosophy Hall can accommodate only 180 or so. Judging from the rapt attention of the audience during Mr. Hochman’s performance and the prolonged ovation, no one felt short-changed by the program (the first of three on consecutive days). The idea is for people to take a midday break, gather in a cozy space and focus on hearing a single work. The First Partita, the shortest, is “sunny, open and innocent,” as Mr. Hochman, a 29-year-old Israeli, explained. Yet the music has “flecks of darkness and complexity,” he added. Though hearing just this piece allowed the audience to experience those aspects of the work, Mr. Hochman’s sensitive performance also compelled you to listen. In his comments he was soft-spoken and intelligent, and those qualities characterized the playing of this gifted, fast-rising artist as well. Many pianists try to evoke some of the detached prickly tone of a harpsichord when they play Bach’s keyboard works on the piano. Not Mr. Hochman. His sound was lovely, rounded and warm. He played with refined legato, smooth phrasing and generous, though never blurry, pedal. The opening Praeludium, a graciously ornamented theme, which, as Mr. Hochman explained, simply embellishes the rising notes of the major scale, emerged in a calm, unforced pace. In the Allemande and Corrente movements, Mr. Hochman maintained graceful tempos that were never rushed, allowing him to highlight quirky inner voices and contrapuntal details. There was lyrical poise in the Sarabande, gentle humor in the Menuets and impressive clarity in his fleet Gigue. Following tradition, Mr. Hochman lingered afterward to speak with his grateful listeners; many promised to return."